Omar Vizquel, the leader in nearly all defensive stats for shortstops, is a Cleveland Indians fan-favorite who helped the team make two World Series appearances. 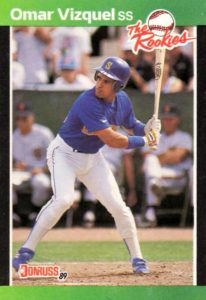 Debuting in major league card sets in 1989, many of the key Omar Vizquel baseball cards are some of his earliest releases. This list aims to highlight some of Vizque's best card options including a few notable autographed cards. Beginning his career with the Seattle Mariners, Vizquel was given the nickname "Little O" for his smaller frame. However, his stature would help him at shortstop and he played an astonishing 24 seasons in the majors. A winner of 11 Gold Gloves with nine straight awards between 1993 and 2001, Vizquel holds the record for most consecutive games at shortstop without an error. Vizquel played 11 of his 24 seasons with the Indians, providing amazing defensive play in their run to the World Series in 1995 and 1997. 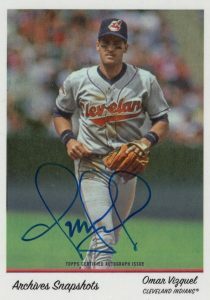 Shop for Omar Vizquel autograph cards on eBay. Like other Venezuelan players such as Andres Galarraga and Ozzie Guillen, Vizquel enjoys an increased popularity with foreign fans. 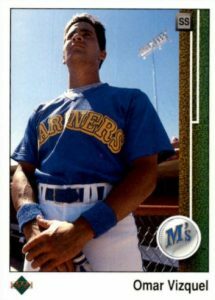 As Vizquel frequently played in Venezuelan winter leagues, trading cards made for those leagues, particularly by the card maker Line Up, are very popular, but hard to locate in American markets. 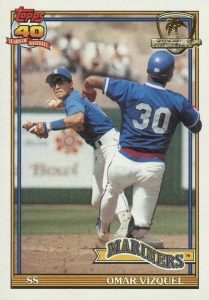 One notable example is in 1993-94 Line Up where Vizquel and Galarraga share a card as members of the Caracas Lions. Fans of error cards can find a Vizquel rookie-year error from 1989 that makes the list below. He is also a frequent signer in high-end releases. The autograph options for Vizquel in 2016 products include Topps Tribute, Topps Tier One, and Topps Strata. Although Vizquel has an impressive case for the Hall of Fame based on his defensive skills, his initial election might be tougher since he is in the same 2018 class as Chipper Jones and Jim Thome, who were famous for their offensive game. Election to Cooperstown would certainly bump up values so now would be a great time to start building an Omar Vizquel card collection. In placing Little O's cards on the list, the main criteria includes card value, design, and each card's importance to Vizquel's overall hobby legacy. Baseball's Best was a Donruss creation that cut out the lesser-known players and focused on stars and a few rookies. Surprisingly, the Vizquel card doesn't feature him at all. Instead it is Mariners utility man Darnell Coles at the plate about to receive a pitch. All the 1989 Baseball's Best cards have the green border design and the product was only available as a complete set at retail stores rather than hobby shops. The 2016 Topps Archives Snapshots set was available exclusively through the Topps website and promised an autographed card in every box. It gets positive reviews for the archival photographs used and Vizquel is featured during his days with the Cleveland Indians. As seen below, Vizquel's signature is very unique with three oversized loops for the "O," "Q" and "L" letters. Vizquel has also signed for many more modern sets. Check out some of the other current Omar Vizquel autographs on eBay. 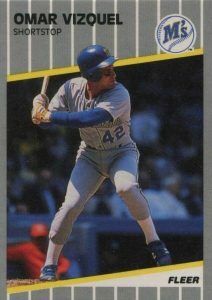 The first of four error-free Vizquel rookie cards to make the list can be found in the memorable 1989 Upper Deck set. Vizquel was included with the high-number cards, narrowing the box options to pull his rookie. His photograph was taken from an angle that makes him look larger than life as he stands at attention, possibly during the National Anthem. 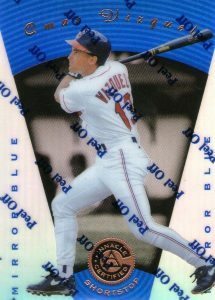 While Griffey is the star of the Low Series, the Omar Vizquel card is the lone rookie highlight in the High Series. Although Donruss messed up on Vizquel's 1989 Baseball's Best card, they got it right in The Rookies mini-set. 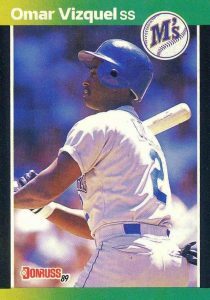 In total there were 56 cards in the set and the overall highlight is Ken Griffey Jr.'s Donruss debut. Although the reverse side doesn't include any major league statistics, the write-up does mention that Vizquel took over as the Mariners' shortstop early in the 1989 season. At the end of his career, he was the last player in the majors to have played during the 1980s. 1989 Fleer Update was originally only for sale as a complete set that featured a whole host of rookie cards and traded stars on its checklist. Vizquel's longevity was unprecedented as he became one of the few players to appear in games over four decades, and the only shortstop. He was also the oldest player to ever play the position in the history of the sport. In addition to the Certified base set, Vizquel has four parallel versions that offer options for collectors at each budget point. Red and Mirror Red parallels check in lower while the Mirror Blue is more for the high-end collector. Mirror Gold would be for those with more money than they know what to do with. Vizquel is featured batting from the left side of the plate and he was a successful hitter from either side. Although not known for his outstanding offense, Vizquel ended his career with 2,877 hits, good for third place among all shortstops behind Derek Jeter and Honus Wagner. Vizquel is featured in a great action photo on his 1991 Topps card and the gold-stamped 1991 Topps Desert Shield version. He is shown in the middle of turning a double play with Chicago Cubs outfielder Dave Clark sliding into second to break it up. Like many of the records held by Luis Aparicio, Vizquel would eventually top them including the record for most double plays for a shortstop. It is estimated that 6,800 Desert Shield sets were created, making it one of the lower print runs of the early 1990s. 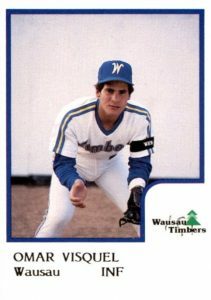 Omar Vizquel is found on several pre-rookie, minor league cards. One of the earliest is his appearance in 1986 Procards for the Wausau Timbers single-A team. 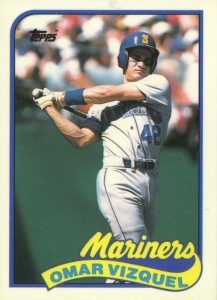 Originally signed by the Mariners in 1984, Vizquel would end his career in 2012, 28 years later. He retired as the all-time hit leader for Venezuelan players and is also the modern-era leader in sacrifices. 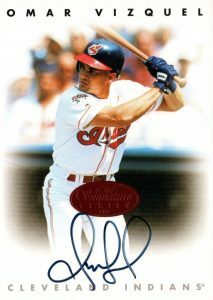 The premiere Omar Vizquel autograph can be found in 1996 Leaf Signature Series, a set that also features the earliest autographs for many players in the 1990s. As Vizquel was not among the short prints, there are plenty of autographs in each of the parallel versions available to collectors. Fans can distinguish the versions by the color of the stamp in the middle of the card with Bronze (featured below) at 3,500 copies, Silver with 1,000 copies, and Gold limited to 500 copies. Vizquel's first appearance in a Topps product came in 1989 Topps Traded. While popular on its own, collectors looking for something a little more rare should track down the high-gloss Tiffany parallel. Much like the regular traded sets, the Tiffany release also came in a separate set available only in hobby shops. It is estimated that the production level was 15,000 sets for 1989 Tiffany Traded and gem-mint graded copies of the Omar Vizquel rookie card can reach $80 at auction.